For the last year our team at KiBiz Systems has been working on the new KiPoint 3 user interface redesign. We’re pleased to announce that very soon we will be releasing KiPoint 3. KiPoint POS is one of the leading FileMaker POS solutions for iPad, Macintosh and Windows. KiPoint POS is a powerful highly customizable FileMaker POS solution that has been developed over the last 15 years to integrate all the benefits of KiBiz 7 in a small package that can be used in a retail location or pretty much anywhere. 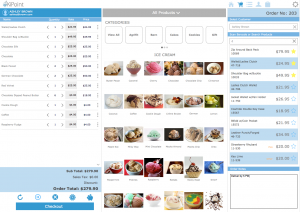 It actually functions as a replacement for a cash register on the most basic level, but when connected on the backend with KiBiz 7 it becomes a super powerful tool that helps businesses streamline, automate and integrate all their key business processes such as inventory, contact management, purchasing, and accounting. KiPoint 3 is now able to process payments, with Apple Pay, Android Pay, and soon EMV. KiPoint POS can handle the requirements of a multi-store deployment, by providing a central database to track gift cards, store credits, and inventory. To learn more about KiPoint 3 click here.